The modern day saw asymmetric warfare around the world in which air power is of vital importance. Aerial operations using the superior airpower are the core part in enhancing the prowess of the troops in controlling the rival counterparts for a battle victory. 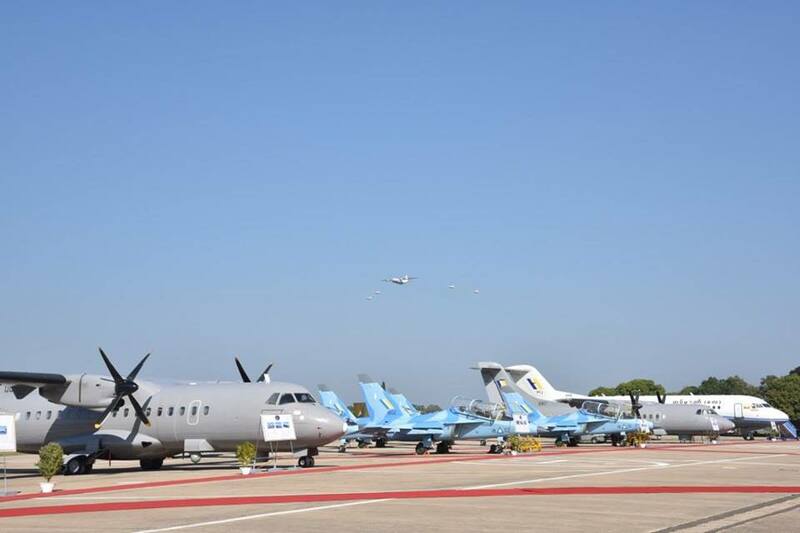 So the air force of the Tatmadaw must be transformed into a modern air force to have superior air power, said Commander-in-Chief of Defence Services Senior General Min Aung Hlaing at the ceremony marking the 70th Anniversary of the Tatmadaw (Air) and the commissioning of military aircraft held at Air Training School in Meiktila Station this morning. In honour of the anniversary and ceremony, the Senior General wore the uniform of the Tatmadaw (Air). Also present at the ceremony were Daw Kyu Kyu Hla, wife of the Senior General, Commander-in-Chief (Navy) Admiral Tin Aung San, Commander-in-Chief (Air) General Khin Aung Myint, retired C-in-Cs (Navy), retired C-in-Cs (Air), senior military officers of the Office of the Commander-in-Chief, the commander of Central Commander, commanders of airbase headquarters, officers, other ranks and families from Meiktila Station and war veterans of Tatmadaw (Air) and invited guests. 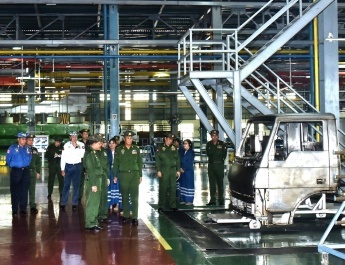 General Khin Aung Myint elaborated on the commissioning of aircraft. 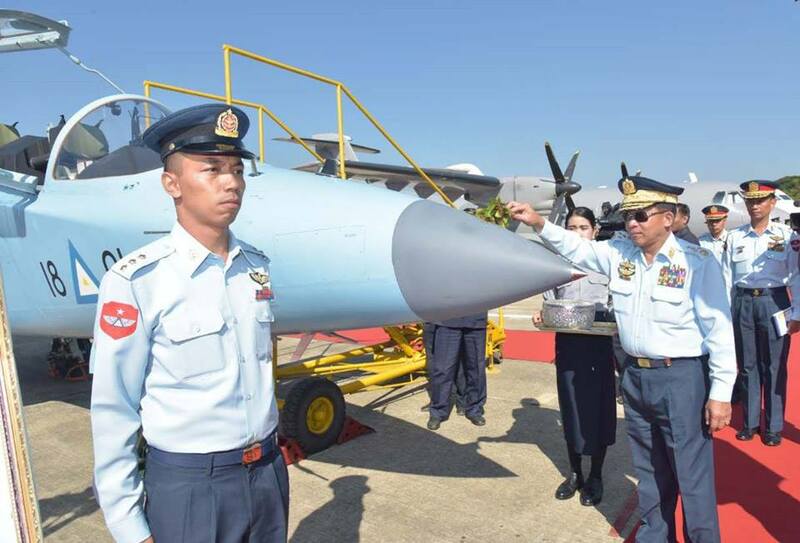 In his speech, the Senior General said the commissioning of aircraft is an auspicious moment not only for the Tatmadaw (Air) but also for the whole Tatmadaw. It is also one of the main steps towards a Standard Army. As the material support including machines and weapons is not enough for modern armed forces, constant training must be conducted to skillfully operate the advanced military hardware. The skill together with self-actualization, military science, military law and sciences must be harmoniously observed or applied in the practical field. Training ensures durability and skill. Durability means the training for individual material fitness of every soldier and skill involves training for skilful application of military equipment, military tactics and military sciences. The Tatmadaw must sharpen its combat prowess and power to become modern armed forces standing shoulder to shoulder with its international counterparts. So the Tatmadaw must produce skilled pilots, technicians and gunners. The Tatmadaw (Air) must enhance human resources step by step apart from equipping itself with state-of-the-art planes/helicopters and military hardware in raising its air prowess. Advanced weapon and military equipment must be applied and the production of skilled soldiers who can handle them well has also become important. 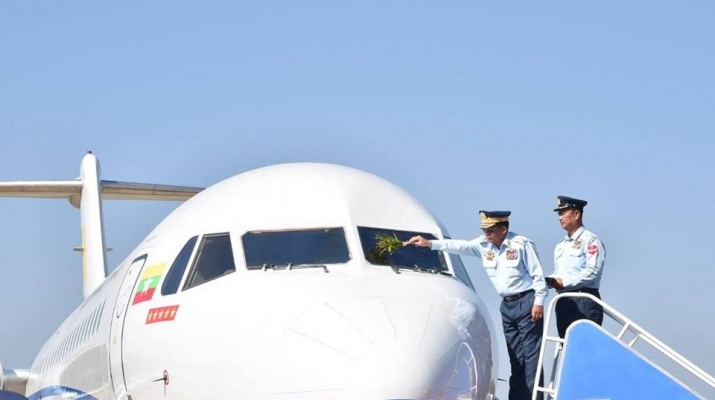 The Senior General said the history of the Tatmadaw (Air) proved its ability to crush multi-coloured insurgency that broke out soon after the independence was regained with available planes that were very few. The Tatmadaw (Air) brilliantly served its duties in driving out the alien intrusion and crushing internal insurgency together the Tatmadaw (Army), the Tatmadaw (Navy) and the people. When compared with the countries in the surrounding area, the Tatmadaw (Air) legged behind in technological generation. In the 1990s it could use the second generation jet fighters, mid-level transport planes, high-calibre multi-purpose helicopters. In 2011 it started using the fourth generation MIG-29s and was able to catch up with the neighbouring countries and regional countries. It advanced itself from the stage of using propeller-driven aircraft to jets and jumped pass to reach the fourth generation jets. 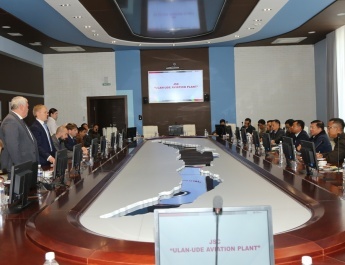 As it is impossible to reach the fourth generation directly pilots must be trained with mid-level trainers in producing frontline combat pilots the main requirement of national defence. The Tatmadaw had to shoulder not only duties of preventing alien aggression and ending internal armed conflicts but also national defence duties. Throughout successive eras, the Tatmadaw has sacrificed a lot of lives, blood and sweat in order to safeguard national sovereignty. In achieving eternal peace it will also play a part in accord with the six-point policy of the Tatmadaw under the leadership of the government. Doing national politics means carrying out national duties. In shouldering such duties, the Tatmadaw needs to be strong and capable. 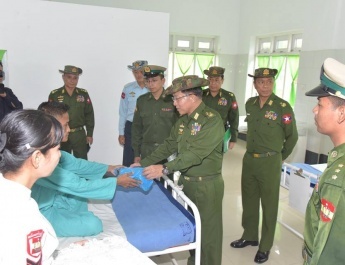 Only with strength and capability, will the Tatmadaw be able to serve and protect the interests of the State and the people, said the Senior General. 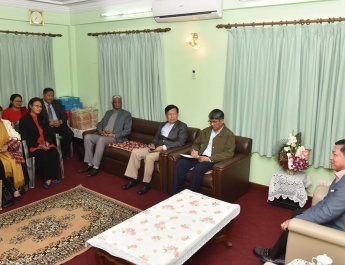 He continued to say that it is known to all that in accordance with Chapter (7) of the State Constitution, the Tatmadaw has tried its best to prevent internal and external dangers and render assistance whenever natural disaster befell. 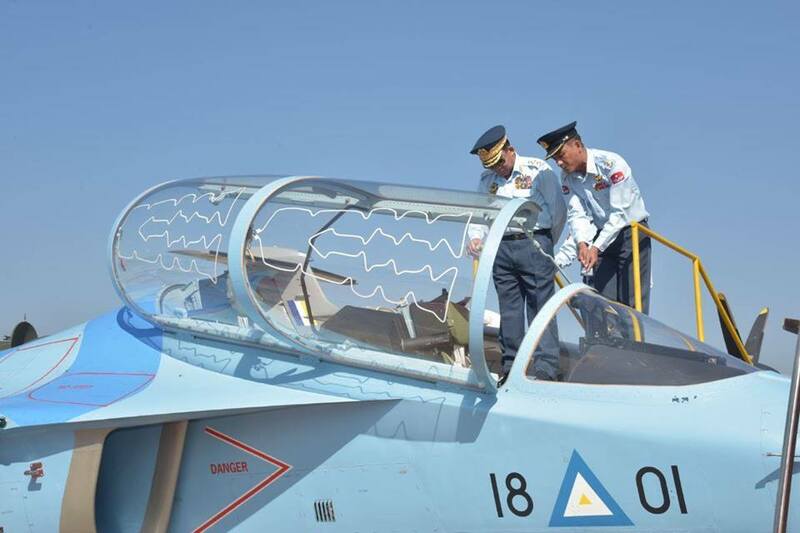 Regarding the provision of new military airplanes, the Senior General called for systematic handling of those aircraft, which are like weapons of the Tatmadaw, in line with one of the military codes of conduct “Cherish your weapon” to promote the Tatmadaw’s image. 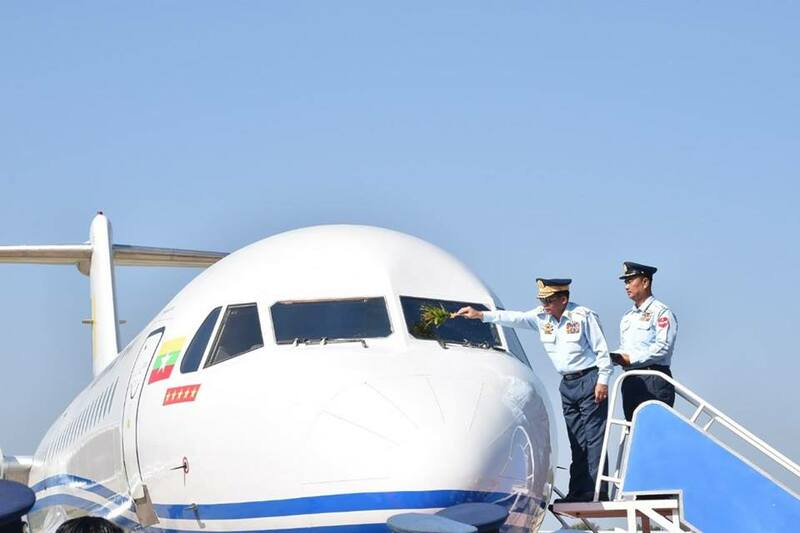 Next, Chief of Staff (Air) Maj-Gen Maung Maung Kyaw declared that the airplanes had been commissioned into service. Commander-in-Chief (Air) General Khin Aung Myint presented a commemorative gift to Senior General Min Aung Hlaing. Then, airplanes and helicopters showed skill demonstrations. 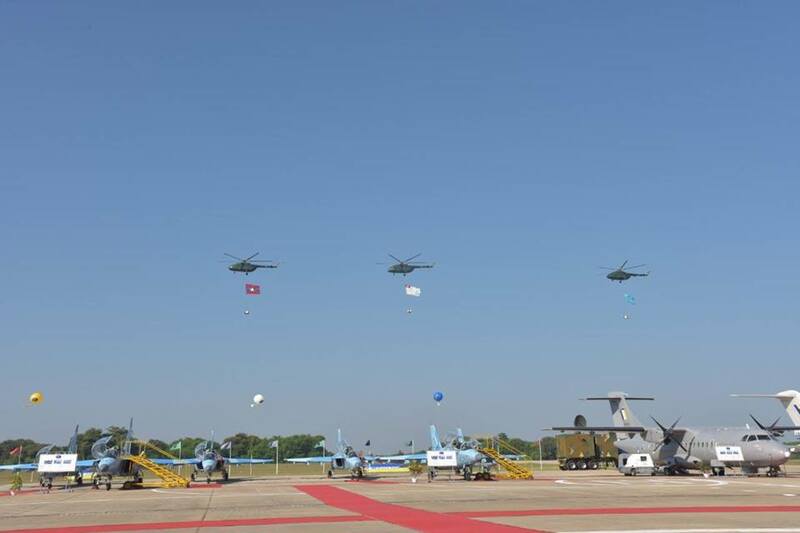 The demonstrations included flying a transport helicopter carrying a State Flag, flanked by two trainer helicopters, flying three transport helicopters carrying flags of Tatmadaw (Army, Navy and Air), flying a trainer helicopter and two trainer airplanes in V-shape called VIC formation, flying a light transport helicopter and two trainer airplanes in VIC formation, flying three trainer airplanes of different kinds used as trainers in flying courses in VIC formation, flying a light transport airplane and two helicopters in VIC formation, flying a light transport airplane and four trainer airplanes in arrow head formation, flying three light transport airplanes of different kinds in VIC formation, flying a trainer airplane with superior power and a multi-purpose jet fighter in composite formation, flying a heavy transport airplane and four jet fighters in arrow head formation and flying five attacker jet fighters in arrow formation. They made their flights saluting the Commander-in-Chief of Defence Services. Afterwards, the airplanes showed their acrobatic skill demonstrations—flying three multi-purpose jet fighters in different directions such as English alphabet 8-Shape called Level 8 formation, maximum banking turn, combat turn, aileron roll and fan break. Later, the Senior General and party released 70 birds, sprayed the operational airplanes with scented water and viewed round them. After posing for a documentary photo, Senior General and party cordially greeted the former C-in-Cs (Navy and Air) and retired military personnel of the Tatmadaw (Air). 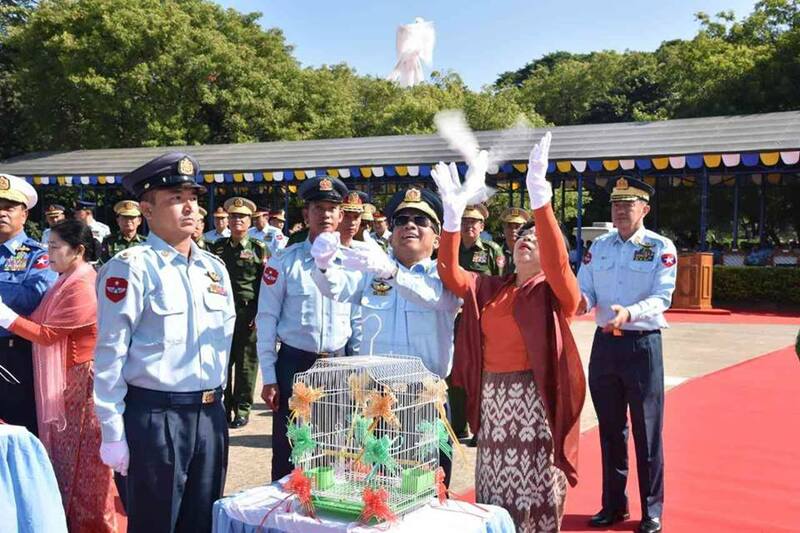 the Tatmadaw (Air), a dawn meal-offering ceremony and a military parade were held in the morning under the leadership of Commander-in-Chief (Air) General Khin Aung Myint. At today’s event, six Yak-130 airplanes, two Fokker-70 airplanes and two ATR 42-320 airplanes totalling 10 were put into service.